All of the above militias were renamed as Regiments. The Upper Saluda District Militia was renamed to the Spartan Regiment. The Forks of Saluda District Regiment was renamed to the Lower District Regiment. The Craven County Militia was split into two - the Upper Craven County Regiment and the Lower Craven County Regiment. The Spartan Regiment was split into two - the 1st Spartan Regiment and the 2nd Spartan Regiment. Sometime prior to the Fall of Charleston, Col. Archibald McDonald created the Kingstree Regiment in the Williamsburg District - either late 1779 or early 1780. This regiment was placed within the 4th Brigade of SC Militia under BG Alexander McIntosh prior to the Fall of Charlestown. With most of the brigadier generals as POWs due to the Fall of Charlestown on May 12, 1780, the overarching brigades of militia were disbanded, and the existing regiments of militia were left to their own devices to reorganize and recruit new men. The militias realized that the best way to combat the British was to create more mobile units - on horseback. 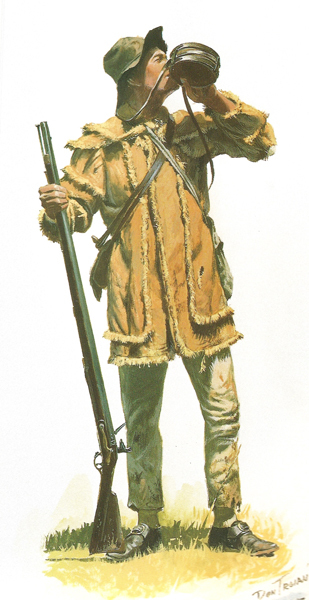 Militia infantries simply could not face the British regulars, so why bother establishing more units of infantry within the militia regiments to be mauled at every skirmish or battle? Therefore, after the Fall of Charleston virtually all new units of militia were Light Dragoons - mounted infantry. The Granville County Regiment was split into two - the Upper Granville County Regiment and the Lower Granville County Regiment. Two new regiments of militia were established in May/June of 1780 - the Kershaw Regiment and the Turkey Creek Regiment. In July and August of 1780, five more regiments of militia were established - Polk's Regiment of Light Dragoons, Hampton's Regiment of Light Dragoons, Roebuck's Battalion of Spartan Regiment, and the Hill's Regiment of Light Dragoons. Most of these regiments of militia began to be assembled into two new brigades of militia - SC 1st Brigade of Militia, led by Col. Thomas Sumter; and, SC 2nd Brigade of Militia, led by Col. Francis Marion. Five regiments remained somewhat independent and did not immediately join these two brigades. Col. James Williams was promoted to Brigadier General, but he was killed before he even knew about it. By January of 1781, a third brigade of militia was established - SC 3rd Brigade of Militia, led by Brig. Gen. Andrew Pickens. Both Sumter and Marion had already been promoted to Brigadier Generals by this time. By this time, all regiments of militia assembled into one of these three brigades. During April of 1781, BG Thomas Sumter was authorized by Gov. John Rutledge to establish six new regiments of State Troops within his brigade that previously consisted of only militia - the SC 1st Regiment of State Dragoons, SC 2nd Regiment of State Dragoons, Hampton's Regiment of Light Dragoons (earlier militia), Polk's Regiment of Light Dragoons (earlier militia), and Hill's Regiment of Light Dragoons (earlier militia) - plus one other that is yet to be determined. There are some indications that all three of these Brigades were now considered to be State Troops - at least at the brigade level. The existing regiments of militia continued as previously to be assembled into these three brigades. However, two regiments left Sumter's brigade and allied themselves under Pickens' brigade - the Turkey Creek Regiment and the New Acquisition District Regiment. Lt. Col. Peter Horry created a new regiment in February of 1781 - Horry's Light Dragoons - in Marion's Brigade. By October of 1781, this would evolve into a new regiment of state troops. Maj. Hezekiah Maham was authorized to create a new regiment in March of 1781 - Maham's Light Dragoons - in Marion's Brigade. By October of 1781, this would evolve into a new regiment of state troops. Lt. Col. Samuel Hammond created a new regiment in April of 1781 - Hammond's Regiment of Light Dragoons - and this was attached to BG Andrew Pickens' brigade. This would be designated as a new regiment of state troops in September of 1781. In September of 1781, the State Legislature authorized the SC 4th Brigade of Militia, with Brig. Gen. John Barnwell as its new commander. Samuel Hammond was promoted from Lt. Colonel to full Colonel and his reigiment of militia was redesignated as SC State Troops by Gov. John Rutledge. This regiment remained attached to BG Andrew Pickens. Many of the existing regiments were re-aligned within these four brigades as a result. BG Francis Marion was authorized to establish two new regiments of State Troops within his brigade that previously only consisted of militia - the SC 3rd Regiment of State Dragoons and the SC 4th Regiment of State Dragoons - in October of 1781. Lt. Col. Henry Hampton left Sumter's Brigade and took his regiment to join up with BG Francis Marion in November of 1781. BG Thomas Sumter resigned and Col. William Henderson was commissioned as Brigadier General to replace him. On January 17, 1775, the SC First Provincial Congress resolved "that the inhabitants be diligently attentive in learning the use of arms; and that their officers be requested to train and exercise them at least once a fortnight." By the end of February of 1775, each parish and district had assembled companies and some regiments of militia, albeit that their readiness varied greatly. The two regiments first raised in the Charles Town District became the nucleus for the first two SC State Regiments of Infantry, and the regiment raised by Col. William Thomson in the Orangeburgh District became the nucleus for the third SC State Regiment of Rangers. The remainder of the Charles Town District Regiment of Militia was given to Maj. Charles Cotesworth Pinckney and he was soon promoted to Lieutenant Colonel. The Orangeburgh Regiment of Militia was turned over to Lt. Col. Christopher Rowe. As one would expect, changes began almost immediately after the formation of these regiments of militia. Col. Thomas Fletchall decided by September that he was "at heart" a Loyalist and was forced to resign. The Upper Saluda Regiment was then given to Col. John Thomas, Sr. Col. John Boddeley (?) soon took over the Berkeley County Militia, and Maj. Andrew Williamson took over the Ninety-Six District Militia. On November 18, 1775, the SC Second Provincial Congress resolved "that every company of militia throughout the colony should be assembled, mustered, trained, and exercised once a fortnight." On November 21, 1775 the Second Provincial Contgress resolved "that the commissioned officers of the colony regular troops take precedence of officers of equal degree in the militia, without regard to prior dates of commissions in the latter, provided nevertheless, that a 2nd Lieutenant in the regulars shall be subordinate to a 1st Lieutenant in the militia, and so on in gradation in the regulars and militia respectively. That the precedency in the regular forces be according to the number and denomination of the regiments of infantry, and rangers, and the regiment of artillery, according to the custom of the British army. That all corps of regulars take precedence of all corps of militia. And that the regiments of militia shall take precedence in the following manner: Berkeley County, Charles Town, Granville County, Colleton County, Craven County the lower part, Orangeburg, Craven County the upper part, Camden, Ninety-Six North of the Fish-dam Ford and between Enoree, Broad and Saludy Rivers, the New Acquisition South of the Fish-dam Ford, and between Broad and Saludy Rivers North of Enoree, and between Broad and Saludy Rivers." On November 23rd, the Congress resolved "that where any person hath regularly entered into a volunteer company, he shall not be at liberty to leave the same, without giving his Captain three months notice in writing, of his intention to do so, and without first producing to his said Captain a certificate from some other Captain of the regiment that he hath enrolled himself in another company; unless the commanding Officer of the regiment shall, on sufficient cause to him shewn, make order to the contrary." The next day, November 24th, the Congress resolved "that the Colonels of the militia in the country, do, at least once in three months, muster their regiments in battalions, not exceeding six companies, nor less than three companies." In January of 1776, an artillery battery was constructed at Georgetown with six heavy cannon mounted. This battery was led by Capt. Paul Trapier, Jr. as an independent artillery company of militia. A special committee was formed to investigate how to best cooperate militarily with neighboring North Carolina, and the two provinces hammered out an agreement that was approved by the SC Second Provincial Congress on March 22, 1776, in which they resolved "That three hundred men from Col. Powell's regiment, and two hundred from [Lt.] Col. Horry's (exclusive of the militia on Waccamaw Neck) nearest to the North Carolina boundary-line, be draughted and held in readiness, to march, on shortest notice, when required, to the assistance of that colony. That one thousand men, from the district of Salisbury [NC], should be draughted, and held in readiness, to march, on the shortest notice, when required, to the assistance of this colony. And, that all expenses attending troops sent, from on, to the relief of the other colony, should be paid by the colony from which they are sent; and that on stating a proper account between the two colonies, the balance, in which one shall be indebted to the other, shall be forthwith paid." On March 23, 1776, the SC Second Provincial Congress resolved "That the regiment of militia, commanded by Col. Richard Richardson, be, in the following manner, divided into four battalions; each under a Lieutenant- Colonel and Major resident in the district, and the whole under the command of Col. Richardson, viz. That part of the said regiment lying eastward of Santee and Wateree rivers, into two battalions, to be divided by Rafting Creek, from the mouth and north branch thereof up to its source, and thence by a line due east to Lynch's creek; and the other part of the said regiment, lying westward of Wateree river, into two other battalions, to be divided by Wateree creek, and the south branch thereof up to its source, then down Jackson's creek to the mouth, and to Shyra's ferry on Broad River." On March 28, 1778, the South Carolina General Assembly resolved that the South Carolina militia would be henceforth divided into four new "brigades" of troops: SC 1st Brigade of Militia - Brig. Gen. Stephen Bull; SC 2nd Brigade of Militia - Brig. Gen. Richard Richardson; and, SC 3rd Brigade of Militia - Brig. Gen. Andrew Williamson, SC 4th Brigade of Militia - Brig. Gen. Alexander McIntosh. There are no more known records from the Provincial and/or State Legislature that pertain to militias.